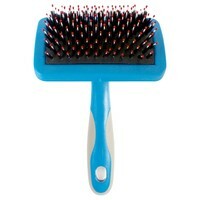 Ancol Ergo Hedgehog Slicker is a revolutionary new design of brush for your dog. Created with an ergonomic handle for comfort, the Hedgehog Slicker features 2 different sets of bristles on the same facing. Long rounded metal pins penetrate the coat for deep cleaning; gently stimulating your dogs skin, they pull out dead hairs and remove any dead skin cells. Shorter nylon bristles meanwhile are there to remove any debris or loose hair and stimulate the hairs natural oil to give your dog a healthy, glossy coat. Further advice on grooming your dog can be found on the reverse of the products packaging.